Tech Wear's Traditional jacket has lapel-style collars and set-in sleeves to give it a professional look. Standard features also include three roomy patch pockets, snap-adjustment at each sleeve termination for a perfect fit, and powder-coated snap closures for scratch-free, color-matched good looks. Size: Medium. 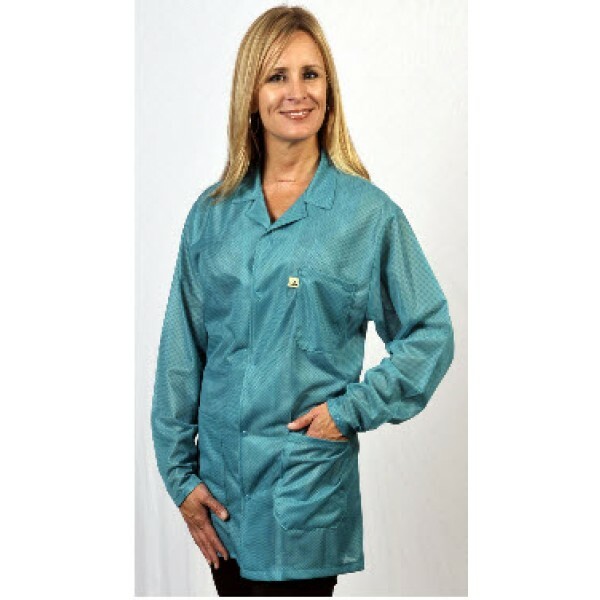 This garment is made of ESD-Safe materials. The static dissipative properties do not come from any kind of spray-on application. Custom embroidery or patch available - please call or email our Customer Service department for details. Tech Wear ESD-Safe 32"L Traditional Jacket OFX-100 Color: Teal Size: Large.